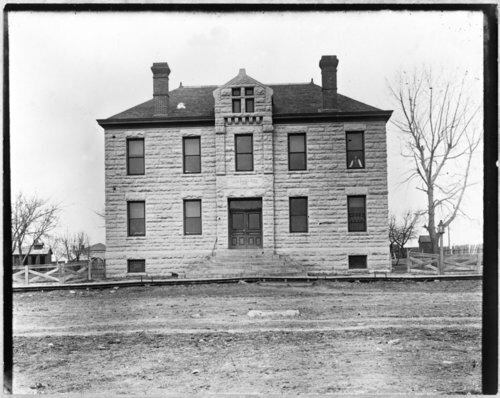 Photograph of the newly constructed courthouse in Wabaunsee County, Kansas. This was Alma's second courthouse which was constructed in 1872 after a February 21, 1871, election, once again, challenged the location of the county seat. During the election, Alma promised to build a stone courthouse if it was affirmed as the county seat. Alma won the election and built the courthouse at a cost of $8,000, with half the money coming from private donations. The building was demolished in 1932, and much of the stone was crushed and spread on the streets of Alma.